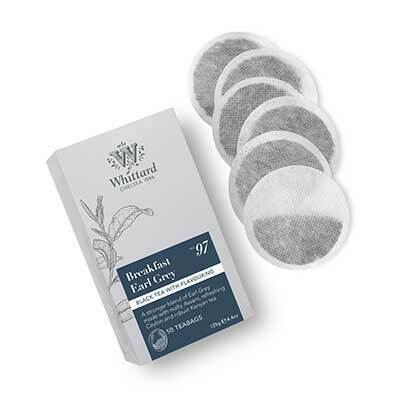 Looking for Breakfast Earl Grey Teabags? We've given our traditional Earl Grey tea a stronger twist to make it perfect for drinking at breakfast time. Breakfast Earl Grey fuses malty Assam, crisp Ceylon and mellow Kenyan black teas to create a vigorous blend with just the right kick for mornings. It still has the irresistible, delicate bergamot taste, but is livelier than classic Earl Grey. I prefer Earl Grey to English Breakfast, but some mornings I just need that EB kick to get my day started. This tea is a great mix of a darker tea with just enough bergamot to shine through without becoming too citrusy or floral. It's defintely worth a try for Earl Grey fans. Earl Grey is one of the world's most popular blends, but not everyone knows that its distinctive flavour comes from the bergamot orange. This fruit has been grown in the Italian region of Calabria since 1797, so we've given this tea the number 97.